Use this open ended game with 2 to 4 students for reinforcement during drill/practice of skills like sight word drill, math facts drill, articulation drill, fluency drill, answering questions and other tasks that children need motivation to complete. 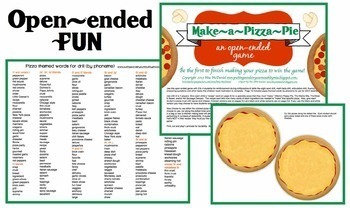 I use this in my speech and language sessions along with the optional pizza vocabulary list (sorted by phoneme). 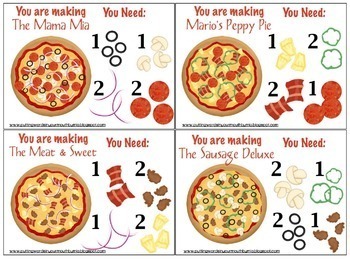 Each child is given a “recipe” card for a specialty pizza that they must “make.” Students pick cards to collect the toppings that they need for their pizza! Watch out for wild cards! 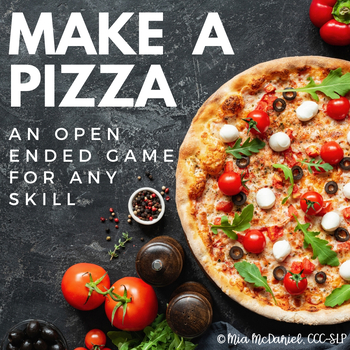 The first player who collects all ingredients needed for their pizza, wins the game! Both full color and black and white versions are included. Print, cut and play! Laminate for durability. Bon Appetit!